2018 provided plenty of opportunities for successful investing in Asia. Growth of the value of Asian stocks, and the 6.6% growth of the region leader, China’s economy, has shown that the Asian market is able to withstand the shocks from the stock market. The macroeconomic trends show a region which has all of the qualities for sustained economic success: from a young and sufficiently educated population, to low unemployment numbers and low debt to GDP ratios. It’s unlikely that the Asian region will take away the focus from regions like Europe and North America, in terms of investor attention in 2019. Yet, the year is looking out to be a successful one for Asian markets. Passive investing in Asia is quite similar to passive investing in other regions. The main difference for non-Asian investors lies in the passive investing opportunities they have access to, compared to Asian investors. Investors from Asia have an easier access to investing opportunities in Asia, while investors from other continents may face more difficulties. Passive investing is defined as investing which follows passive investments, rather than active ones. These passive investments are index funds, ETFs, and mutual funds. Passive investing philosophy is based around minimizing transaction costs, time dedicated to finding new investments, and time needed for trading them. Passive income investments are becoming more and more popular. The rising popularity of passive income investments could be partly caused by the investors wanting to minimize risks, and to diversify their investments. Passive income investments offer many benefits over active investing. The benefits include easy portfolio diversification, possibility to lower risk (because of inherent diversification), and lower trading costs. These passive income investing benefits can be maximized by investing in the up-and-coming continent of Asia. List of government bonds from Asia. Accurate as of February 2019. Copyright: Money Bear Club. Three Asian governments are expected to release their own bonds in the near future. These governments are Uzbekistan, Laos, and Cambodia. The decision of the governments to release their own bonds, will open more opportunities to investors interested in passive investing in Asia. One reason why passive investing in Asia through bonds can be good choice, is the relatively high yield bonds of Asian governments. Although under 5% yields aren’t uncommon, risk-tolerant investors can find plenty of options of investing in over 7% yield bonds. Over 7% yearly gains are likely to beat inflation in most parts of the world, and deliver plenty of left over profits. Like any other investment, higher gains in bond investing, comes with higher risks. A default seems unlikely for most of the issuers of Asian government bonds. However, the possibility of it is higher for bonds with higher yields. Overall, the Asian bond market presents a varied investing experience for the investors. Government bonds of Asia range from negative yield bonds of Japan, to the very high yield rates of Sri Lanka and Bangladesh. A high yield ETF focused on the Asian region, could also be a smart move in the face of the macroeconomic trends of 2019. The declining business confidence rates of USA companies, the fast growth of GDP in Asian countries, and the declining value of European investments – all point to the need to invest in the Asian region. A high yield ETF would mean a diversified investment into higher-risk bonds. Because of the opportunities the Asian region provides (compared to other regions), the gains could be worth the risk an investor would take on. Some of the more notable high yield ETFs focused on Asia include the iShares Barclays USD Asia High Yield Bond Index ETF and the FTSE Asia ex Japan High Dividend Yield Index ETF. The iShares ETF seeks to track Barclays Capital Asia USD High Yield Diversified Credit Gross TR index (excluding Japan). The FTSE ETF seeks to track the performance of the FTSE Asia Pacific high dividend yield index (excluding Japan, Australia and New Zealand). Change of real GDP growth of China from secondary and tertiary sectors. Source: https://snbchf.com/wp-content/uploads/2018/01/2018_01_25-Chinese-GDP-800×478.jpg. The increasing contribution of the tertiary (services) sector of China to real GDP growth, shows that China is transitioning into a more developed economy. Moreover, the exporting focus is shifting to high added-value industries. Republic of Korea credit rating since 2007. Source: https://countryeconomy.com/ratings/south-korea. Constant improvement and a stable credit rating of Republic of Korea, shows its balanced economic perspective. Pakistan exports share change. Source: https://image.slidesharecdn.com/currentissuesinmacroeconomicmanagement-091226234902-phpapp02/95/macroeconomic-management-in-pakistan-7-728.jpg?cb=1396100950. The decreasing share of primary commodities and semi-manufactured goods in exports of Pakistan, show that the exporting industry of the country is becoming more developed. A passive investment through an ETF into countries where macroeconomic statistics and credit rating are steadily improving, would likely be a rather safe bet, and a rational choice. The most varied passive income opportunities in Asia come from the ETFs focused on the region and its companies. These include the China ETFs (KWEB, MCHI, GXC), the Semiconductor ETF (SOXX) and the Emerging Markets ETFs (EMQQ, FEM, SDEM). A passive investment into a Semiconductor ETF (SOXX) and the Emerging Markets ETF (EMQQ, FEM, SDEM) can be a good choice for investors who are looking to invest into the manufacturing prowess of Asia, or the developing markets in Asia. The SOXX ETF, a semiconductor ETF, includes the Taiwan Semiconductor Manufacturing Co Ltd ADR (headquartered in Taiwan), among other, mostly USA-located, semiconductor companies. The semiconductor industry sales have grown from $137 billion in 1997 to $412 billion in 2017. An investment into a semiconductor ETF can be a good choice, as the demand for semiconductors seems unending, and likely won’t become smaller. A new technology, which would replace semiconductors, is likely the only serious threat to this industry. The emerging markets ETFs includes companies like Tencent, Alibaba Group, NAVER and JD.com (EMQQ); PT Charoen Pokphand Indonesia Tbk, Inner Mongolia Yitai Coal Co Ltd (FEM); Dubai Islamic Bank PJSC, Lite-On Technology Corporation (SDEM). These companies represent a varied landscape of investments in Asia. From technology companies in China and Republic of Korea (Tencent, Alibaba Group, NAVER) to food production and manufacturing companies in Indonesia and China (PT Charoen Pokphand Indonesia Tbk, Inner Mongolia Yitai Coal Co Ltd), passive investing in Asia offers many opportunities in many different countries. Analysis of the performance of emerging markets ETFs shows that it contains world-famous companies with strong potential for expansion. With stable income increases in emerging markets, the demand for the products of the companies in these ETFs, is also likely to increase. Residual income ideas concentrating on the Asian market can also include income from unconventional investing, like peer-to-peer lending. Yet, residual income ideas in Asia can face difficulties in implementing them. Some Asian governments can change their opinion quickly on unconventional investing services. Hence, investors looking to generate residual income in Asia should be able to easily cope with unexpected changes of their investments. The China ETF (PGJ, KWEB, CHIQ) is focused on the largest, in terms of population, country in Asia. China is a global manufacturing giant, which produces from 48.2% of the world’s total of coal, to 90.6% of world’s personal computers. The exchange traded funds focused on China, like KWEB and PGJ mostly feature web, e-commerce and communications companies. Investing in the China ETF can be a smart move in today’s economic climate. While China won’t overtake USA as the global economic superpower (by nominal GDP) in 2019 and likely, in 2025, its macroeconomic trends show that there is still room for even stronger growth and development. The Chinese unemployment statistics are also a good indicator for making predictions about the successes of passive investments. Since more than 25% of the Chinese labour force is employed by manufacturing and production companies, a decline in the employment of the Chinese labour force could a be a predictor of lower demand for manufactured products. However, since the shadow economy in China exists, workers who work in it don’t make an impact on official unemployment figures. Thus, the real Chinese unemployment rate could be a bit different, and lower, from the official one. Chinese unemployment statistics. Source: http://marginalrevolution.com/wp-content/uploads/2015/08/atlas_VJYtG-js@2x-1024×576.png. The most visible trend in Chinese unemployment statistics is the decline in unemployment after the 2008 financial crash, and the slowly changing percentage of the unemployed workers. The under 5% unemployment figure is an important achievement for the still developing country, and shows a successful management of unemployment in China. The Chinese inflation statistics also support the argument that China’s macroeconomic state is strong and well-maintained. Inflation in China has been falling since 2011, and will likely remain in the under 2% zone for a longer time. Chinese inflation statistics. Source: https://edge.alluremedia.com.au/uploads/businessinsider/2017/03/China-cpi-and-ppi-Feb-2017.jpg. Above all, the most important macroeconomic statistics for China are GDP growth, and the number of new businesses opened every year. Investors react strongly to Chinese GDP statistics, and its one of the indicators which can more or less set the tone for investing in China for the year. Luckily for investors focused on China, the country has been experiencing a seemingly unending GDP growth. The China’s GDP is unlikely to reverse in the near future (at least 5 years), and the outlook for the Chinese economy still remains positive. The number of new businesses opened every year is a very important macroeconomic indicator for passive investing in China. China’s growth has been built on the entrepreneurial spirit of its citizens. Therefore, a reduction in the number of new businesses opened could mean that the Chinese entrepreneurs are facing difficulties or are doubtful about the economy, and their ability to develop a business. However, this has not been the case in the last few years. The Chinese entrepreneurs are opening more and more businesses every year, and the number of new businesses opened every year has grown by 11.8%. That’s an impressive growth percentage for an economy whose fastest growth years are already a few years behind. China’s macroeconomic statistics and their trends point to an economy with a strong potential for sustained future growth. A passive investment related to China or Chinese companies is likely to be a good choice. Especially, when considering the growth in the numbers of new businesses, and a stable unemployment rate. Value investing is all about finding hidden gems in the form of investments. Assets, which are underpriced in relation to their fundamental qualities, are the main goal in value investing. Value investing in Asia would be directed at finding industries and investment opportunities which are fundamentally underpriced, yet also equipped with a strong future perspective. These include Fintech companies, real estate in developing cities in Asia, and infrastructure projects and companies. One venue which could be a good target for value investing in Asia is its emerging Fintech industry. Financial technology companies have made great strides in Europe, and to a lesser extent, in North America. In these regions, they are mostly funded by venture capital investors, and investing in them by the general public is mostly impossible. Fintech companies in Asia are different, and give more opportunities for investors. Firstly, a Fintech investment in Asia is far easier than a Fintech investment in Europe or USA. Fintech companies in Asia tend to turn to public offerings much faster than the same companies in other regions. And companies going public only gives Main Street investors more opportunities to invest. Also, since the Asian economy is far larger than the European Union or USA, Fintech companies in Asia have far more room to quickly scale-up and improve their revenues. However, a Fintech investment in Asia is rarely a goal for most investors in Europe and North America. Fintech firms in the Asian region are rarely given attention to by the Western media. Because of low cultural exchange (in terms of financial technology), investors in other regions of the world could miss out on the opportunity to invest in Fintech companies in Asia. Some Fintech firms in the Asian region like China Internet Nationwide Financial and China Rapid Finance Limited, have achieved great growth statistics, and are offering high quality products for the ever-growing Asian market. Yet, their value and prices per share seem to be fundamentally undervalued. Real estate investing in Asia is a rather conventional choice, as the continent enjoys a growing population and growing incomes. The best place to buy investment property, like anywhere else in the world would be a city with stable growth, and a quality of life which attracts high-income residents. Buying investment property is not an easy task, and bureaucracy is involved. However, buying investment property is an investment decision which can protect assets from inflation. Some examples of cities which could be the best places to buy investment property in Asia are Shanghai, Ho-Chi-Minh City, and Jakarta. These three cities have achieved amazing growth in the past ten years, and are still expanding. They also have turned from attracting lower and middle-income residents, to attracting high incomes ones. Their best quality is that they still offer the authentic spirit that started their growth. While technical factors like the presence of businesses (and, accordingly, jobs) and governmental institutions are the main drivers of city growth, authenticity has become a quality that is important for potential residents. Pull factors for real estate investing in Asia. Copyright: Money Bear Club. Best cities to invest in real estate in Asia, through the lenses of value investing, would be the ones with potential for tourism. Some countries like Japan and Thailand have a long history of tourism. Their tourism real estate market is fairly well-developed and isn’t in the stage of fast growth. Other countries in Asia, like Cambodia, and Laos are just opening for tourism, yet they also have much to offer to tourists. Lesser-known Asian cities, in safe locations, and with plenty of historical heritage, could be the best cities to invest in real estate in the coming decades. The tourist flow to Asia is increasing, and is expected to expand from 1.3 billion to 1.8 billion in 11 years. Half a billion more tourists in 11 years, comes down to 45 million more tourists every year. That’s a large increase for such a small period of time. Tourism in Asia is relatively concentrated in a few main regions and cities. Yet, the situation is expected to change. The now less-popular cities like Xi’an and Raja Ampat are expected to become popular tourist attractions. The best property for investment in real estate would likely be located in cities like these. Taking advantage of tourism to Asia spreading out to lesser-known locations could be a sound real estate investing decision. The value real estate in cities like these, is fundamentally undervalued, and does not account for the expected increases in tourist numbers. Hence, a good real estate investment in Asia could be related to its tourism sector. Infrastructure investing in Asia, from a certain perspective, can be classified as one of low risk investments. Infrastructure investing, in general, carries a lower risk than other types of investing. Infrastructure projects are most often vital for the communities they are built for, and have a backing from the government. This makes investing in infrastructure a lower risk decision than investing in non-vital, and completely privately backed projects. The most straightforward way of earning investment income from infrastructure projects in Asia, is acquiring shares of infrastructure companies (building, piping, connections) operating in the region. Infrastructure projects are deeply tied in with building companies, as they are the ones that build them. Hence, investing in building companies of Asian countries, where large infrastructure projects are common, would be a rational choice. Infrastructure investing in Asia also can be a part of one of the major 21st century projects – the Belt and Road Initiative from China. The programme launched in 2013, and since then has created many infrastructure initiatives in Europe, Asia, and Africa. As one of the major sides of the Belt and Road initiative are Chinese building and infrastructure companies, investing in them could be a safe bet (accounting for the backing of the government of China and foreign governments). Countries, where infrastructure investing may bring the most stable gains, include countries with a practice of constantly rebuilding homes. In Japan, few homes are being built to last for a lifetime. Homes in Japan are most often built with a plan to demolish them after three decades. This keeps the construction industry in Japan extant, and creates a stable demand for new houses in the islands. Thus, investing in infrastructure companies (which are closely related to the trends of construction industry) in a country like Japan, almost certainly will bring stable gains. One of the most important indicators which has to be analysed and tracked in order to make money from investing in infrastructure, is the GDP per capita year-on-year change. GDP per capita numbers for Asia have changed radically in the last 20 years. While the average GDP per capita for Asia in 1999 was $6,090, in 2017 it was $6,638. A GDP growth projection for Asia for 2019 expects Asia’s economy to grow by 5.8%. The continued growth leads to the conclusion that Asian countries have achieved the ability to sustain growth, while also developing their own economies. Average GDP per capita of Asian countries in 1999. Data source: World Bank. Copyright: Money Bear Club. GDP growth or its projections aren’t a straightforward indicator that an infrastructure investment will be successful in the region. Nevertheless, an investor will have an easier time making money by investing in regions and countries with a strong showing in macroeconomic indicators. Building of infrastructure projects intensifies in times of economic growth. Hence, investors which are looking to invest in infrastructure projects of Asia, should follow the GDP growth trends of the continent. The GDP outlook for Asia remains positive, and only a few difficulties could discourage growth (US-China trade war, increasing regional tensions). Nevertheless, the Asia’s GDP outlook could change, if the predicted global recession (end of 2019 – start of 2020) will happen. Investment income is not only dependent on the corporate practices of a company or a well-thought out business plan. Macroeconomic trends and the right political decisions of governments often play a far more important role than individuals and their business ideas. Thus, for the sector where government support is especially important (infrastructure), investing should be closely tied to the larger economic picture, rather than individual achievements of businesses. Investing in Southeast Asia is not the conventional investing choice. Southeast Asia still struggles to shed the stereotype of a poorer region, and Southeast Asian companies don’t carry much recognition outside of the region. However, unconventional investing choices can often lead to nice gains. Investing in Southeast Asia can be the right investing choice from the perspective of macroeconomic indicators. The total GDP of Southeast Asia has been steadily rising since 1998. In this case, the Southeast Asian region countries are the ASEAN countries and Timor-Leste. Southeast Asia GDP growth in trillions of dollars. Source: https://data.worldbank.org/indicator/NY.GDP.MKTP.CD?contextual=default&end=2017&locations=VN-LA-KH-TH-MM-ID-MY-SG-PH-TL-BN&start=1998. The total GDP increase in Southeast Asia also coincide with lower unemployment rates. The change in these indicators points to the conclusion that productivity of Southeast Asian companies is increasing, and that the production outputs are also increasing. Southeast Asia unemployment rate change (percentage of the total labour force). Source: https://data.worldbank.org/indicator/SL.UEM.TOTL.NE.ZS?end=2017&locations=TH-MY-BN-ID-TL-PH-VN-MM-KH-LA-SG&start=2007. Southeast Asia exports in billions of dollars. Source: https://data.worldbank.org/indicator/NE.EXP.GNFS.CD?end=2017&locations=TH-MY-BN-ID-TL-PH-VN-MM-KH-LA-SG&start=2007. The steady rise of exports shows that ASEAN countries are growing their GDP per capita numbers not only due to internal consumption, but also because their exports are increasing. The increases in GDP and exports can be a signal for investors looking to invest in Southeast Asia. Investing in companies and industries with a strong future due to increasing exports, can be the right argument for investing in the Southeast Asian market. Moreover, since the region’s exporting power is supported by relatively cheap labour, and an increasingly educated population, the trade potential can be expected to grow in the future. Some exporting industries in Southeast Asia include machinery and mechanical appliances, vehicles and their accessories, and rubber. Philippines, Thailand and Vietnam are the countries with the highest production outputs in these industries. The Philippines have a developed exporting industry of rubber production. Thailand is famous for its prepared or preserved fish production. ASEAN countries also can be attractive to investors which specialise in investing in clothing production, food production, and the fishing industry. The exporting industries of ASEAN countries mostly focus on these sectors. Most recently, the ASEAN countries exported more than $65 billion dollars worth of preparations of meat, of fish or of crustaceans, molluscs or other aquatic invertebrates, according to the International Trade Center. Investing in startups in the Southeast Asian region is a high risk decision. While the average population of a Southeast Asian country is at almost 60 million, and the average GDP adjusted for PPP in the region is $671 billion, to invest in startups, the investor would have to know the specifics of the business environment in the region. Some successful startups in Southeast Asia (Grab, Lazada, Go-Jek) have managed to attract millions or even billions dollars of investments in sometimes, multiple funding stages. Investing in startups in Southeast Asia would likely mean investing in a e-commerce, delivery, finance, or travel companies. These industries likely would be the best choice for investing, as Southeast Asian per capita incomes are increasing, and with them, an appetite for the consumption of non-necessity items. Continued GDP increases show that investing in Southeast Asia is a rational decision (at least by the judgement of macroeconomic trends of the region). Real GDP growth of ASEAN countries. 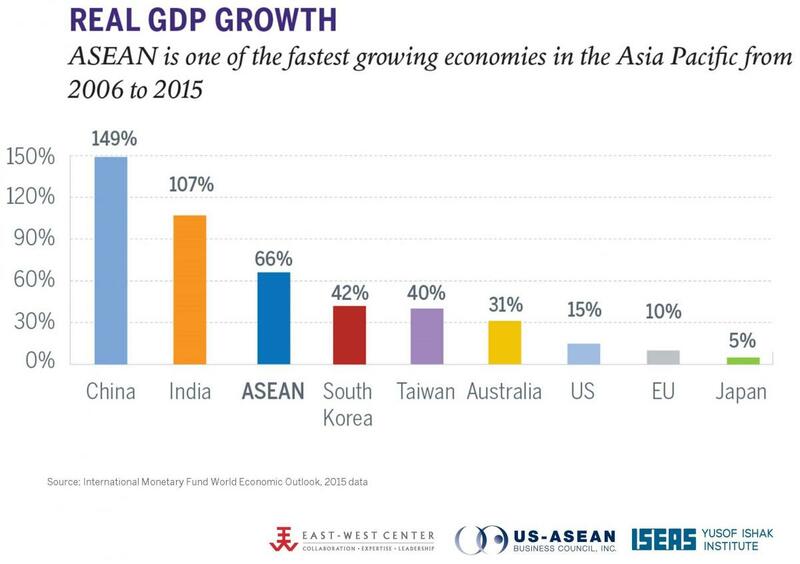 Source: https://asiamattersforamerica.org/sites/default/files/field/image/ASEAN/NewNewASEANGraphics/Real%20GDP%20Growth.jpg. The total GDP of Southeast Asia increasing by a speed that is rare in the 2010s, shows that its production, tourism, and development potential is just being unlocked. Either way, the investors must analyse why the GDP increase of Southeast Asia is happening at this time period, rather than any other. Answering this question will let the investors correctly identify patterns of growth in the region. If the growth is happening because of sustainable economic policies, and smart financial choices of businesses and governments, then the patterns of growth can be explained by a logic of clear causation. If the growth is happening because of cheap factors of production, and relatively cheap exports, then the patterns of growth will become much harder to predict and identify. The region, composed of 5 countries (Turkmenistan, Kyrgyzstan, Kazakhstan, Uzbekistan, Tajikistan), is one of the least developed regions in Asia. The region’s saving grace seems to be its richness in natural resources like oil and gas. And yet, the investing perspectives for Central Asia are not as bleak as they may seem at first. The countries in this region have been over going trade liberalization processes. The initiative to improve the investment environment now more usually than not, comes from the inside of the governments. The most well-known companies of Central Asia include Air Astana, KazakhGold, and Alif Capital. The most successful exporting industries of Central Asia are the oil and gas industries. Moreover, the last great reserves of oil and gas are located in the Central Asian region. From the perspective of the Asian stock market, relatively few Central Asian companies have gone public. These include JSC Halyk Bank and KCell. The Asian stock market is far more saturated with Chinese, Japanese, and Korean companies, rather than Central Asian ones. Yet, the region is undergoing an economic transformation directed at liberalising the economy, and thus more companies could take the step of going public. One resource that Central Asia is rich in, but few people know about, is its platinum, copper and gold reserves. The platinum metal, copper metal, and gold reserves have only started to be explored in the 20th century. Moreover, the political change process which happened at the end of the 20th century, and the start of the 21st, only halted the exploration and extraction processes. However, in the 21st century, the macroeconomic impact of precious metal extraction and trade has increased in Central Asia. The bulk of export income in Central Asia is received from trading oil and gas, and precious metals. The precious metal sector also play an important role in the employment statistics of Central Asia and its economic development. Many gold extraction companies operate in Central Asia, and their cooperation with the local governments provides the much-needed foreign investments, and jobs. Resource extraction companies specialising in the extraction of oil and gas are the pillars that have enabled the fast GDP growth of some Central Asian countries. The GDP differences of Asia and Europe would be far more obvious, if the demand for oil and gas wasn’t as great, and the Central Asian countries didn’t have plenty of these resources. Risks of investing in Asia are closely tied to macroeconomic trends in the Asian region. These risks include GDP misjudgment, changing debt to GDP ratios, and geopolitical change. Increasing debt to GDP could be a double-edged sword for Asian countries. On one hand, increasing debt to GDP ratios could mean that Asian governments are confident in their ability to pay back loans. To these Asian governments, a certain financial future, which does not include difficulties in paying back loans, is in sight. Overall, this means that the development of the region could be increasingly financed through debt. On the other hand, the increasing debt to GDP in these Asian countries could mean that fiscal responsibility in these countries is decreasing, and that governments are facing challenges that can’t be solved by financing them through the countries’ own budgets. This most likely is true for countries which have had to borrow to pay off their previous loans (Bhutan) and which run vanity projects, and don’t have a strict fiscal responsibility (Turkmenistan). Other risk of investing in Asia includes the misjudgment of GDP growth in Asia. While GDP growth statistics may present a favourable economic picture, real GDP growth statistics (GDP growth adjusted for inflation), can lead to entirely different conclusions. Asia’s GDP growth, when it is adjusted for inflation, at least in this period of time, presents a different statistic. Large differences in GDP growth and real GDP growth of Asia could mean that some investors may be mislead by the nominal GDP growth numbers. Making misleading conclusions could lead to unprofitable investment decisions. GDP growth of Japan. Data source: OECD (2019), Nominal GDP forecast (indicator). doi: 10.1787/dad11be4-en (Accessed on 04 February 2019). Copyright: Money Bear Club. In the case of Japan, their nominal and real GDP growth, in 2017, had a very small difference. Real GDP growth of Japan. Data source: OECD (2019), Real GDP forecast (indicator). doi: 10.1787/1f84150b-en (Accessed on 04 February 2019). Copyright: Money Bear Club. GDP growth of Indonesia. Data source: OECD (2019), Nominal GDP forecast (indicator). doi: 10.1787/dad11be4-en (Accessed on 04 February 2019). Copyright: Money Bear Club. Yet, Indonesia’s nominal and real GDP growth, in 2017, had a very large (almost 5%) percentage point difference. Real GDP growth of Indonesia. Data source: OECD (2019), Real GDP forecast (indicator). doi: 10.1787/1f84150b-en (Accessed on 04 February 2019). Copyright: Money Bear Club. Geopolitical changes can also heighten the risks of investing in Asia. Intra-Asia trading often is the largest source of export revenue for Asian countries. Any difficulties in trading between important partners, could also mean that supporting countries would see their trading numbers diminishing. Asian leaders have created a more or less stable continent. Most geopolitical problems are coming from regions of countries, rather than whole countries (Kashmir region in India and Pakistan; Taliban-controlled regions in Afghanistan, radical Islamist regions in Philippines and Indonesia). However, the continent, as any other, is not immune to drastic geopolitical changes. Delving deeper into the relations of Asian countries and their main trading partners, and accordingly choosing the right investments, can be an investment safeguard against geopolitical change in Asia. The outlook on investing in Asia is definitely positive. Varied indicators point to the conclusion that Asia is one of the best places to invest in. The very different regions of the continent bring many contrasting investing opportunities. Yet, the perspective an investor looks at investing in Asia can make or break an investment. A hesitant or even negative perspective on investing, can lead to cashing out too early, and not fully taking advantage of the growth the region offers. Disclosure: the author does not own, and has no plans to own any of the financial assets mentioned in this article. Like this article? Support Money Bear Club on Patreon for more! ‹ Money Bear Club Answers: What gives better returns, trading stocks or long-term investing?